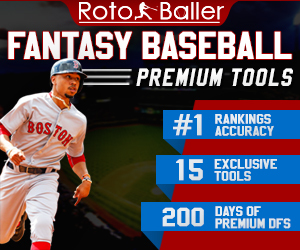 The clock ticks ever closer to Opening Day and we here at RotoBaller are back to give one final round of position-by-position analysis with a mixed-league, 5x5 framework. We’re going to start at the most glorious position on the field: first base. No, I didn’t play first myself, why do you ask? While there are some fun late-round flyers here, 1B is not a position to wait until the late rounds to fill. Our mixed-league staff rankings come straight from the minds of myself, JB Branson, Pierre Camus, Bill Dubiel and Scott Engel. We’ve got them broken down into tiers for your digestive benefit and to help ease along the analytical process. Our ranks are some of the deepest you can find -- checking in at over 750 players! 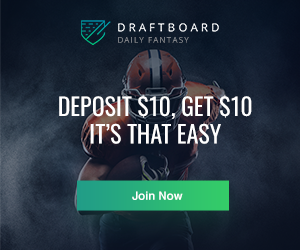 -- and we'll be updating them right through Opening Day, so be sure to bookmark our fantasy baseball rankings dashboard for the latest and greatest. Without any more delay, let's test our sprint speed and hustle to the updated fantasy baseball first base rankings for March. Staff ranks are as of March 18th, 2019. 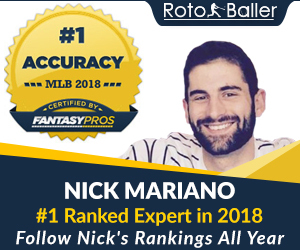 In case you missed it, our very own "Big Pick Nick" Mariano was recently named the #1 overall most accurate industry expert ranker for the 2018 season. You can see his secret sauce below! 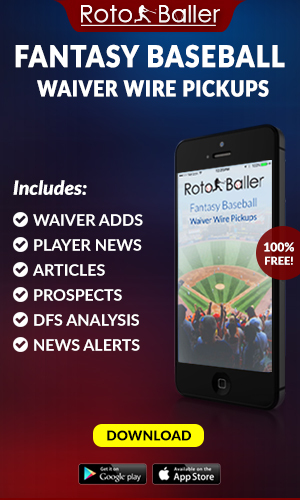 Additionally, industry legend Scott Engel recently joined the RotoBaller team and provides his insights as well. Scott is a FSWA Hall Of Famer and award winner. There’s little argument within our cohort about who the top-two first baggers are, with Freddie Freeman and Paul Goldschmidt pulling away from the rest towards the top-20. Interestingly, four of us have no more than a five-pick gap between the two, whereas Pierre puts Freeman at No. 9 overall and Goldschmidt at 29. Now, I love Freeman but I can’t vault him into my top-10 unless I knew the elite power would be there. 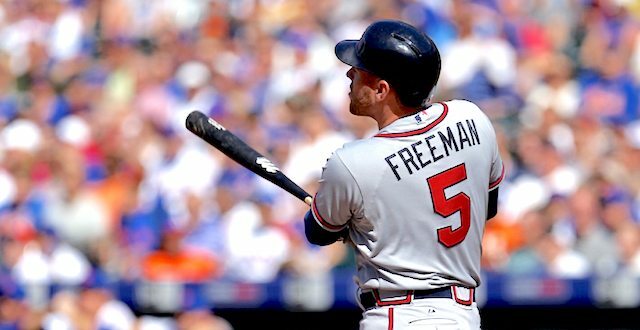 Freeman will always smash the ball with authority, but his fly-ball rate dropped nearly 10 percentage points from ‘17 to ‘18 with an identical rise in line-drive rate. This helped fuel his usual .300-.310 batting average, but 23 homers, 10 steals and an R+RBI tally under 200 despite over 700 plate appearances doesn't scream "first-round production." All projection systems roughly agree on a healthy 95-28-95-9-.300 line, which is wonderful, but I can’t see another leap coming. Then there’s Goldy, who shed an early-season slump that lasted nearly two months only to put up a 1.019 OPS from the closing days of May on. At 31 years old, it’s unfair to expect the days of 15+ steals from him -- he had 11 attempts last season -- and looking to ‘17 isn’t quite fair either. 12 of his 18 steals in 2017 came in the first two months, and then he only stole six the rest of the way. The power and capacity for a .300 average should still be there, along with strong counting stats in the middle of STL’s order, but projecting more than 10 steals feels optimistic. This results in a line similar to Freeman’s that I’m perfectly happy drafting in the second round. 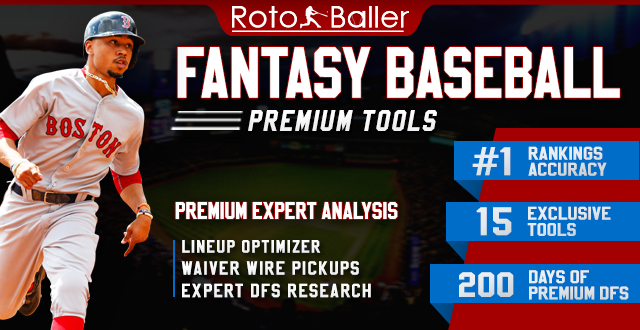 The second tier has a clear frontrunner in Anthony Rizzo, who should be able to cover the power stats of Tier One but will have a slightly lower batting average and a lower range of outcomes for speed. It's worth noting that he's topped 100 RBI in four consecutive years and had hit at least 31 homers in four straight seasons prior to 2018. Getting a high-floor power bat that can contribute speed and some average is commendable. While I am bullish on Rhys Hoskins, it’s clear that Pierre -- who has Hoskins at 26, even above Goldy at 29 -- is a big fan of my No. 1 bold prediction that Hoskins would outproduce Bryce Harper. I’ll need to see some speed or a higher batting average to make that jump in my rankings, but I can envision the ceiling in Year Three for Hoskins. Cody Bellinger falls just behind Hoskins, though he’s similar in having a sophomore setback after an outrageously-hot rookie campaign. Belly and Hoskins also grant you 1B/OF flexibility, but I think those seeking a floor will go with Hoskins and those reaching for ceiling go Bellinger due to the speed element and slightly higher average. Finally, Matt Carpenter hit the soul out of the ball from mid-May to mid-August, posting a slugging percentage north of .700 across nearly half a season that made everyone forget that pesky .272 SLG from his first 35 games. We aren’t weighing OBP here so his patience “simply” equates to more runs for our interests, and he’s still unlikely to chip in more than a handful of steals or top 85 RBI. Projections settle around 90-28-80-.255, which is solid but more in line with Scott and I rather than Pierre, Bill and JB putting him around No. 40 overall. I get it, the ceiling is there, but I’m trying not to overweigh the spikes. It’s debatable that Votto should be in with Tier Two, or that Carpenter should be among Tier Three with these guys, but I felt comfortable carving out Votto and Abreu as their own grouping. Votto’s penchant for contact in a hitter-friendly park and a much-improved lineup has me seeing a resurgence in counting stats. Abreu isn’t bad by any means and I’m surprised to be the low man, but I still worry about the ChiSox lineup and Abreu’s production relative to later names. For what it’s worth, Statcast still gave Abreu an expected batting average (xBA) of .280, as well as grading him with the highest exit velocity (91.3 MPH) of his four-year Statcast window. He’ll be fine. This is a gigantic tier — full of nine players, though J.T. Realmuto will always slide in a C instead —and you do not want to wait past them. Murphy gets to rake in Coors Field, with experts such as Scott and myself putting him within the top-80 and no one landing him beyond No. 100. Encarnacion can still bring it in my eyes and three of my colleagues, but Scott has him beyond 100 picks lower than all of us. Most of the other names are steady, but I must note my “bullishness” on Joey Gallo is likely still too low. The “BA drain” is rather overstated in relation to his insane power. His overall 5x5 finish last year was 90th, despite only notching 577 PAs and hitting .206 along the way. He led all hitters (min. 150 batted-ball events) with an 11.4% Barrels/PA rate, as well as pacing the field with an average exit velocity on flies and liners of 99.8 MPH. It’s pretty scary to see 40 homers as a floor, but if he closes on 600 PAs and carries over a few of these bunt hits from Spring Training then I’m very excited. This is where hopes and dreams start to come alive, as you can see I believe in the resurgence of Miguel Cabrera and Ryan Braun, as well as being bullish with Carlos Santana back at Progressive Field. The only one I’m down on here is Profar, though no one is slotting him in at first base anyway. I’ll let someone else take up that battle. Braun seems to be a popular rebound candidate as people see through the .254/.313/.469 slash line of 2018. He only played in 125 games and hasn’t topped 140 contests in a season since 2012, but 20-plus homers and double-digit steals are very much on the table. In fact, 2018 was Braun’s best Statcast year in the four seasons that BaseballSavant displays, with an xBA of .296, xSLG of .515 and a 49.5% hard-hit rate! He still runs, he can clearly still hit and Milwaukee’s lineup is stacked. Deal me in. Our individual ranks illustrate the polarizing nature of these players well. Scott is all-in on Pete Alonso, which I’m all for if I didn’t have to bake in the Mets toying with playing time. That infield is so crowded even with Jed Lowrie getting hurt, as they may give Dominic Smith a real shot at the 1B job. If Alonso does get playing time then you’re looking at 25 homers, maybe more. I respect it. I would rather scoop Justin Smoak and Tyler White, who I think are getting overlooked for different reasons. Heck, even Trey Mancini deserves more pop from the community. Maybe people think Smoak’s crazy 2017 was a mirage at age-30, but 25 homers and an OPS above .800 is still solid. Toronto’s offense will improve around him as the youngsters come up. Plus, Statcast still gave him a fourth-straight season with a hard-hit rate above 41% and a Barrel rate above 10%, so the life remains within his bat. White swings a strong bat and plays in one of the top offenses in baseball, one that doesn’t have Evan Gattis clogging the DH anymore, yet his ADP doesn’t reflect the range of outcomes. The fact that he’s 28 years old and has yet to play a full season in the Majors may also influence perception here. Let their blind spot be your gain as 25 homers, an average that won’t help or harm you and Houston counting stats. Again, you can find players here that some of us view as top-200 players and viable starters in 12-team formats. Scott loves C.J. Cron. I back Ryan Zimmerman. Pierre and Bill are still in on Miguel Sano. While you don’t want to lean on them, there is value to be mined. I’d be remiss if I didn’t stump for my boy, Zimmy, whose 9.9% Barrels/PA rate was fifth in the Majors out of batters with at least 200 batted-ball events. Joey Gallo, Khris Davis, J.D. Martinez and Mookie Betts were the only ones ahead of him. Not bad, eh? Just stay healthy! For what it’s worth, Cron ranked 31st on that list (out of 281 hitters) so he’s no slouch either. That said, let me explain my trepidation with Cron. His healthy barrel rate was actually backed by a loss in average exit velocity (89.2 MPH to 88 MPH flat) and a slip in launch angle, from 18 degrees to 15.2 degrees. His HR/FB rate had stayed within 12-15%, yet last season it flew to 21.4%. This seems like an outlier season to me, so the 225-250 range feels right for maybe 25 homers and a .260 average with no speed. Can you tell that I’m aboard Team Wilmer? Yes, Flores should have an everyday path to PAs in AZ even after the Adam Jones signing and I am here for it. He’d put up HR/FB rates of 13.6% in ‘16 and ‘17 before it nearly cut in half at 7% last season. At least it came with a five-percentage-point drop in strikeouts -- tough to achieve in today’s climate -- that resulted in a measly 9.8% K rate. He’s still just 27 and THE BAT projects him for a useful 70-21-79-.277 line, with Fangraphs’ Depth Charts going further at 70-23-89-.282. Arizona is no longer a hitter’s park, but I’ll pay the $0 entry fee here. Ryan McMahon would vault up if he wins the starting 2B job in Colorado, but it’s more likely that he and Hampson wind up splitting time as 2B/super-utility types. I want to believe that the Rockies will suddenly wake up and learn how to manage their youth well, but I cannot project that in good faith. Those going for upside late should also give Dan Vogelbach a look. Out of options and with Ryon Healy manning third base in the wake of Kyle Seager’s injury, Vogelbach should have the inside track at first base to open 2019 and has already been told he’s on the Opening Day roster in Japan. What he does with the shot will determine his longevity and fantasy usefulness, but he crushed 20 homers in 84 Triple-A games last year and has pop worth monitoring.